There were arguments outside Celtic Park last night as pro-Palestinian supporters attempted a “peaceful protest” during the Europa League match against Israeli side Hapoel Tel-Aviv. 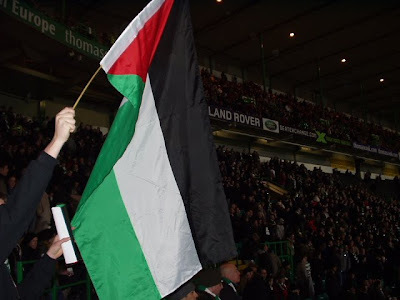 Security officials attempted to move on the 60 or so protesters who were distributing placards branded with the Palestine flag within the Parkhead grounds. Officials said no permission had been given for the protest. The demonstrations were vocally opposed by some fans who saw the trade union’s call to action as a political hijacking of the club. The actions followed on from calls from the Scottish Trade Union Congress for Celtic fans to show their support for the cause during the match. However the club itself had voiced concerns over the plans, saying a crowded football match was, "not the place for a public demonstration", and urged supporters not to compromise safety at Celtic Park. 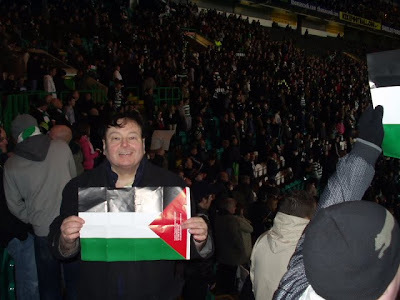 The Scottish Trades Union Congress has been widely condemned for “politicising football” after it handed out thousands of Palestinians flags at the Hapoel Tel Aviv/Celtic match at Celtic Park in Glasgow. 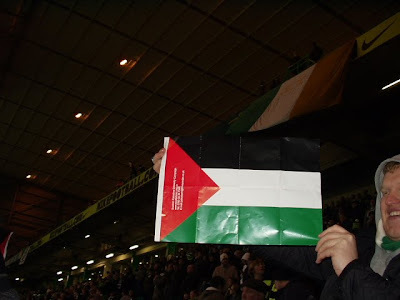 Campaigners from the STUC and the Scottish Palestine Solidarity Campaign took 10,000 Palestinian flags to distribute to fans entering Celtic’s ground as an “act of solidarity” with Palestinians, almost one year after Israel’s operation in Gaza, Cast Lead. Dave Moxham, STUC deputy general secretary, insisted that a demonstration at the game was justified. He said: “This December marks the one year anniversary of the Israeli invasion of Gaza in which 1,400 men, women and children were killed in an act described by the United Nations as ‘indicating serious violations of international human rights’ and ‘amounting to war crimes, and possibly crimes against humanity’. Mr Moxham said he had written to both clubs, “outlining the reasons and purpose of this demonstration and making clear that we attach no blame either to Hapoel Tel Aviv players, nor their fans, for the outrageous actions of their government. But the club strongly opposed the calls for a demonstration. 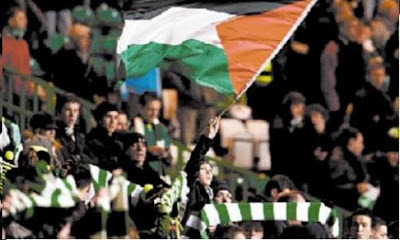 Its spokesman, Iain Jamieson, said: “Celtic Football Club believes in football as a powerful medium for social integration. Celtic has always been a club for all people, regardless of gender, age, religion, race, politics or ability. We therefore believe Celtic Park is no place for a political demonstration”. Match stewards approached the campaigners telling them to stop handing out flags and fliers on Celtic FC property. Some flags were taken inside, though not anywhere near what the organisers had hoped. More than 300 Hapoel Tel Aviv supporters, with a dedicated high security presence, flew Israeli flags and banners. 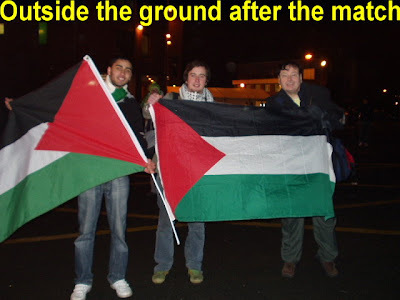 At the end of the match a campaigner tried to run on to the pitch with a Palestinian flag. He was quickly escorted away by police, and booed by Celtic fans. Steven Purcell, leader of Glasgow City Council, wrote to the STUC to express his “disgust” at their using a football match for political purposes. A 53-year-old man has been arrested after an incident involving Hapoel Tel Aviv fans in a Glasgow pub. The man was held after allegedly brandishing an offensive weapon in a pub in Sauchiehall Street before Wednesday’s Europa League game against Celtic. A police spokeswoman said: “A 53-year-old man has been detained by police in relation to brandishing an offensive weapon during a disagreement between two groups of males. Celtic won the game 2-0 but Tel Aviv progress to the next round thanks to Hamburg’s victory over Vienna. Aye I was 1 of the guys that got roughed up. Also I spent a night in the cells for my troubles, charged with breach of the peace but it was a completley made-up charge and they've not even taken a statement from me so I'll be gobsmacked if it goes any further. Winded the polis up constantly about what a joke they are, got a brekkie off em n a sleep in a surprisingly warm cell so it was hardly the worst experience I've ever had. Though I think I may have just been kept warm by ma donegal sweater! Thats a tip to anyone who thinks they may ever possibly be facing the same fate. We were down in section 121 and at the front of the crowd there was some space where we decided to face the pitch then the directors box which was in close proximity. We unfurled a banner saying "stop israeli genocide in gaza" and held up some palestinian flags, The stewards moved in fairly quickly and forcibly took the banner from us, We continued to stand there and wave our flags and 1 of the stewards tried to pull if off me to which of course I wasnt happy to comply and thus held onto it. He pushed me back aggressively then other stewards and polis joined in. I kept my composure as always and told them it was private property, said alls I wanted to do was make a peaceful protest and that I wanted my property back. Stewards and polis were typically hyped up though and because I didnt put my head down and beg forgiveness the officer who seemed to be in charge of the section came over and told tweedledum & tweedledee to "eh, jus do him for breach o the peace, that'll do it" or somethin along those lines. My friends were able to continue waving their flags for a while longer but they soon were made to leave also. 1 of them was threatened with arrest for turning back around with his flag to the crowd. In fairness to alot of the crowd, they began to boo the polis for removing us but as I was being put into the van I had to put up with other so-called celtic fans shouting things like "ye's wouldnt even know how spell palestine never mind know anything about it"
I've been there twice, I've been attacked by both the israeli army and police on numerous occasions and I'm well versed on the history of the region. If people like the one's who were shouting at us had any education on palestine then they'd probably be standing with us! There's far too many 'suits' at cp that havent a clue and don't care (because their ok, they know they can wake up in the morning to find food on the table, fuel to heat their homes and no sound of bombs being dropped around them). I want to make it clear to everyone that we were still inside the crowd section and had made no attempt to get onto the pitch or anythng like that. Its a disgrace that the stewards are able to come in and pull a banner from the crowds section that was in no way racist or sectarian. The banner said "stop israeli genocide in gaza". The flags we waved were palestinian and the 1 I had ripped off me and the stick broken off was split 4 ways, had the tricolour, basque, palestinian flag and starry plough on it. A sad day when we cant even peacefully protest against a member of a govenrment that is ethnically cleansing a region of its indigenous peoples! Get the conservatives out. They're ruining the atmosphere at the games anyway. Seem to think that buying a season ticket constitutes being a fan. Turn up then sit there and watch it as if its eastenders, making no effort to sing or cheer the bhoyz on. People like them are the reason the atmoshphere's gettin killed at CP.